Have you noticed wet spots or consistently damp areas in your yard? Does water pool and collect after a heavy rain? Does the direction of water move towards the foundation of your home and find it’s way to your hardwood floors? The drainage experts at D&R Sprinkler & Lighting can help diagnose and fix your drainage problems. Not all drainage problems are created equal. Our experts will assess your problem, discuss the possible sources of water causing the problem and provide a plan for resolving your drainage headache. Our installation teams work with French Drain, Surface Drains and Grated Drains on a daily basis. In many instances your problems can be resolved with a basic regrading of the soil directing the water towards a more desirable area. 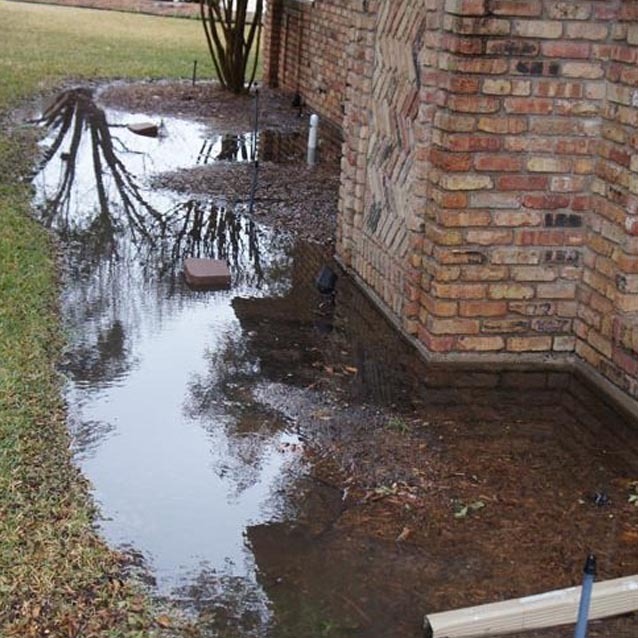 French Drains – Designed for heavily flooded areas that require quick redirection. Can also be used to redirect ground water. A properly installed French Drain can handle large volumes of water in a short amount of time. If your property sits down hill and water flows towards the house a French Drain is ideal for redirection. If the surface area of your roof is large and your yard is small there is often more water than can be absorbed into the ground or redirected with natural grading; thus a French Drain is the optimal option. When installing a french drain we measure the slope, change in elevation and low spots. A trench is dug anywhere between twelve to thirty six inches. A perforated pipe is placed at the bottom of the trench. Landscape fabric is installed above the pipe to prevent soil from clogging pipe perforations. Crushed granite or a similar rock fills up the trenches to allow for easy and quick filtration. Grass will ultimately grow over the trench filled with rocks. We do not suggest laying sod over the drainage system.